It wasn’t long ago that we introduced the new MailUp platform and disclosed that it would be just the starting point of a long list of improvements meant to improve the way you do marketing. Now it’s time to hit the road again. Let’s dive in each and every new feature! You will finally be able to upload a ZIP archive, containing both the HTML and its referenced images, and create a new message. Attachments may also be part of the ZIP, and they will be added to the imported message, if size and extension limitations are met. Please note that imports are editable with the HTML “WYSIWYG” editor and not with BEE. After adding a subject, you can import either a single HTML file (the “old” way) or a ZIP archive. If a ZIP archive is imported, it must be under 20mb of total size to be processed. Files can be either be dragged and dropped or imported by browsing the computer. If the ZIP contains any unallowed file (e.g. executables). When one or more of these conditions happen, a friendly feedback message will prompt you to either edit the message or discard the import. A preview is also available at this stage. Since emails and landing pages can both be created with BEE, we thought that making it possible to create a landing page from an email was a nice bonus feature to speed up your creative processes, as they often share assets and copy. 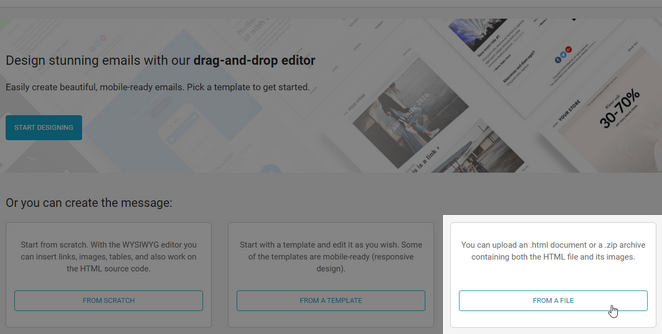 From the Overview page, you can now create a landing page by clicking on the Edit dropdown. Please note that email-specific links and contents (e.g. special links, dynamic content etc.) are not removed, so you will have to edit the landing page to delete them. 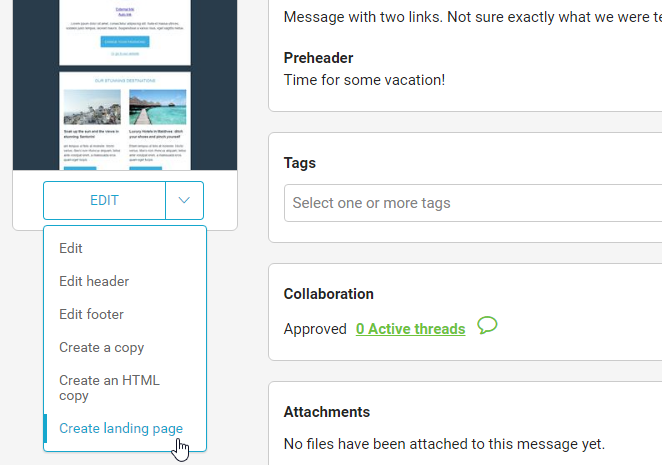 This works the other way around as well, so in Pages > Landing pages, clicking on the Actions button for a landing page, the Create an email action instantly create an email version of that landing page. The Link check tab of the Checkup function has been rewritten and redesigned for improved reliability and usability. 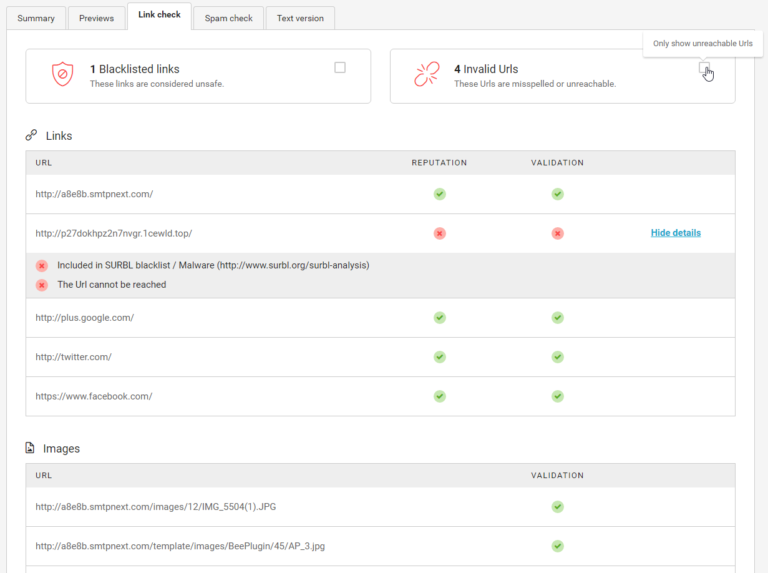 We refined and plugged in our own internal link check service to warn you of blacklisted and unsafe links, in order to provide faster, more precise and more effective insights. We also took the time to redesign the page, by separating links from images, improving error messages and adding a filter to show only problematic links. Please note that reputation is not checked on Images URLs because, at the moment, it does not affect deliverability. So far, you could visually check mobile optimization for your email messages as opposed to a desktop preview. 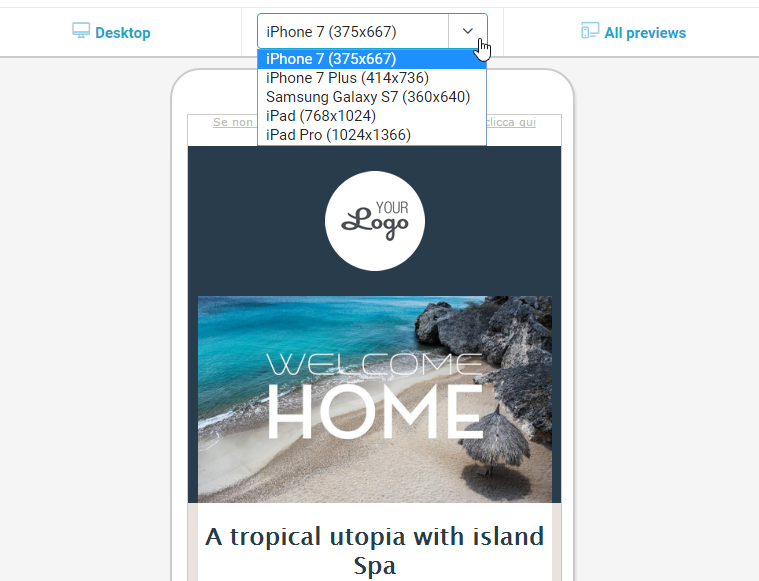 Now we’ve taken a major step forward – changeable viewports will render different mobile sizes and will provide a direct link to Inbox Previews in Checkup. This is a crucial feature if you know (and you should!) how your recipients open their emails: on iPhone, Android phones or iPad? Which version of each? Mobile optimization isn’t optional any more, and it gets more precise and accurate than ever thanks to this new feature. List dashboard: 2 new widgets! 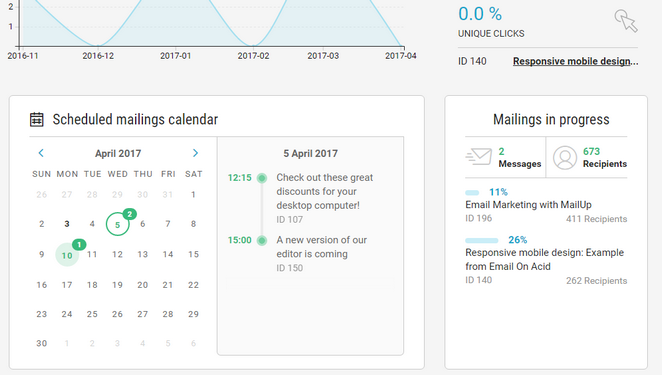 After delivering the new list dashboard with MailUp 9, we immediately started working on ideas for new widgets. We want to make clear to you that this is an area where we are committed to continuous improvement. We found out that the dashboard was missing information on messages that are either going out or have been scheduled in the future for your list. That pieces of information were available only in the Send status page, which however has the scope of controlling the platform sending queue, plus it’s cross-list. So meet our latest additions to the list dashboard! Scheduled mailings calendar. As its name suggests, it offers a calendar view of the messages that have been scheduled for sending. Clicking on a day when 1 or more messages have been scheduled, the panel on the right offers a timeline for those messages. Mailings in progress. This gives a snapshot of the messages that are going out of the platform, with their completion percentage and recipients count. What’s next: as we add new widgets with each release, we plan on making the list dashboard customizable by defining which widgets to show and rearrange their order and size. Plus, the send status will also be getting a calendar version! We’ll be letting you know, in the next few months, when new widgets become available. Which groups is each recipient part of? Tons of you asked for this feature after we introduced the new platform. And we listened. So we added a new Groups tab under recipient profile, to show assigned groups and change such assignments. This features makes it quick to understand at a glance which communications every single user of yours is receiving, and to swiftly move him/her around to other groups. It’s a win! That’s a wrap! As usual, feel free to comment this post for further discussion.